FOR IMMEDIATE RELEASE: SunMaxx Solar CEO, Adam Farrell, recently participated as a panelist in the “Energy and Environment Conference” hosted by Columbia University’s School of International and Public Affairs and The Earth Institute. This panel examined the feasibility of renewables, by looking at the financial structures in place to support solar, wind, and hydropower. The discussion focused on international transactions. Farrell, along with other experts from energy companies, investment banks, and legal arenas, talked about the multifaceted issues surrounding energy globalization. 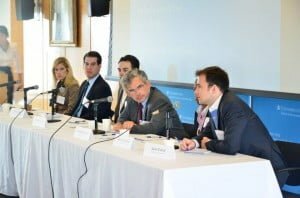 The panelists discussed issues including economic viability, the future role of distributed energy generation, market-based solutions versus publicly-backed solutions, and energy’s changing legal framework. Most importantly, Farrell discussed how solar thermal hot water technology is ever reshaping energy.